Hyundai as a car brand name isn’t that strong as the Japanese’s Toyota & Honda. This applies strongly to Malaysians, but not the rest of the World. Many will be reluctant to buy Korean cars brand such as Hyundai and Kia but once you view those car personally and have a look and feel to it, your impression will changed – especially in these recent years. Hyundai Malaysia ( Hyundai-Sime Darby Motors ) , is set to launch the 6th Generation All-New Fully Imported from Korea – Hyundai Sonata on July 2nd and they did a preview of the Sonata from last Friday until Tuesday (June 29) in their Glenmarie Showroom. We went to review the new Hyundai Sonata and did a test drive on a 2.0 liter model as well as a 2.4 liter model. Normally with the same car name we should be able to see some inheritance from the car’s previous version. However, the new Hyundai Sonata is completely redesigned when compare to it’s predecessor. Designed in California , the all-new Hyundai Sonata is to take on it’s competitor such as Toyota Camry and Honda Accord. With inspiration by an Orchid , we agree that the Hyundai designer team did put quite a few more daring design cue on the car’s front. As i was referring the Hyundai Sonata as the Korean CLS , aside from it’s similar bodyline and low back roof, the headlights too looks inspired by the Mercedes Benz CLS too. With projector headlight for all 3 variants available in Malaysia, which is the 2.0 low spec, the 2.0 high spec and the 2.4 high spec. Only the 2.4L model Hyundai Sonata comes with HID with auto-leveling. The interior of the Hyundai Sonata continues the sweepy lines of exterior of the vehicle. The centre console builds together with simplicity and futuristic looking. The humanoid icon act as a guide line to see your air condition directions, an idea which ripped from Volvo. Only the 2.4 Liter Sonata gets the auto climate air conditioning system. As the interior lights turn on, the blue illuminance is everywhere giving you a futuristic ambiance. The controls are easy to use and understand, unlike the huge buttons with wordings on the latest Honda Accord. Although with great designs, the Hyundai Sonata central dash feel lacking of built quality. The air-con dials and controls does not feels that solid as compare to it’s competitors. Audio systems are standard with cd player and mp3 capabilities. There’s a also ipod integration with USB and AUX-in too. There’s holes on both sides of the audio inputs, one for cigarette lighter, and amother bluish one mainly for in car changers. The steering is integrate with standard audio controls too. The panaroma roof of Sonata, would be another attraction to it’s potential buyer. As compare to it’s class Japanese rival, non of local Japanese car maker provides Sunroof in a 2.0 liter car. The front piece of the sun roof can be open as a window to allow air to flow in where as the rear piece of the sunroof acts as a glass for viewing scenery. Controls of the panaroma roof are easily operated with a touch of a button. The panaroma roof mechanism opens and closes beautifully. Be reminded only the 2.0 liter high spec version and the 2.4 Liter has this feature. All 3 variants of the Hyundai Sonata YF in Malaysia are equipped with leather seats. On the preview days of the Sonata, we were told that with an additional RM800, you will entitle to upgrade to a higher quality leather seats and beige colour. An 8 way power adjustable seat for driver is made available to 2.0 liter high spec and the 2.4 liter Hyundai Sonata. Rear air con vents is available in the all variant of Sonata sold in Malaysia. Only the test drive unit Hyundai Sonata we use in our review, did not have cruise control and rear air-con vents. As standard, the all new Malaysia Hyundai Sonata 2010 comes with standard 17″ alloy rim ( the smaller picture) . However we spotted a 18″ rims with black chrome effect display in the preview days. We were told that the sharp looking 18″ rims ( the bigger picture) are as an optional upgrade but the price has not been confirmed. There’s no full size spare tyre in the Sonata, but there’s a huge boot space available to fit in a few full size spare rim and tyres if you want. The 2.0 liter high spec and 2.4 Liter Hyundai Sonata, comes with a smart key with push start button and immobilizer where as the 2.0 Liter standard Sonata gets a normal keyless entry with a standard key. The side mirrors of the Sonata are electronically retractable and folds upwards stylishly like the BMWs. The new Hyundai Sonata are equipped with new Theta II Dual CVVT 2.0L and 2.4L MPI petrol engines which produces 165ps and 178ps respectively. The engine are designed with a purpose for low emission, and improve fuel economy by reducing the weight of the engine. All variants of Sonata in Malaysia are mated with a gated type 6-speed automatic transmission with shiftronic. We waited a long queue for our test drive and later we were guided along with the Sales advisor to test the new Hyundai Sonata. The keyless entry was disabled and we do not need a key with us at all as we drive out the showroom area. On straight the 2.0 Liter engine did not perform as what we expect, as it claims – a 165ps . However it is a different case when it comes to a 2.4 liter engine. Strangely enough on paper with just additional 13ps compared to the 2.0L the engine feels much more lively. It is much more responsive when compare to the 2.0 liter. As i floored the pedal of the Hyundai Sonata, the “ECO” lights when on to remind me that i should drive with Eco-Friendly conscious. The Hyundai Sonata steering feels a little too near to my legs although my seats where adjusted to lowest and the steering is positioned to highest. The ride of the Hyundai Sonata 2010 it’s comfortable, we were told to get over bumps quickly and the suspension system handles our comfort well. I would rate it’s noise and comfort level it’s between a Camry and an Accord. The gear changes were adequately smooth but it wasn’t that smooth as compare to the Chevrolet Cruze we test drove earlier. Due to the swift curve line on the rear of the Sonata, passengers who are tall might feel less head room in the rear seats. The Sonata is selling for RM135,888 with insurance for the 2.0L standard spec and RM143,888 for high spec. 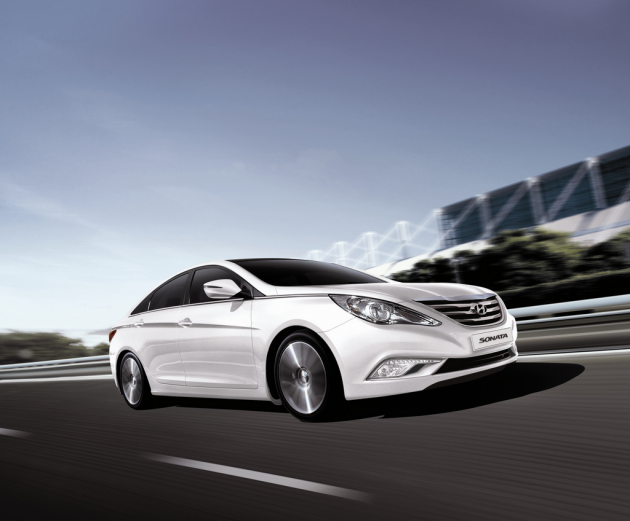 As for top of the range 2.4L Liter Hyundai Sonata, you can get it with Rm163,888 with insurance. Although the price may seem high as compare to the previous version of Sonata but with the enhancement you get – it’s definitely worth the price. At anyways, the Hyundai Sonata is still cheaper than it’s Japanese rivals. If you are still worried with Korean cars reliability, Hyundai Malaysia confidently giving 300,000km or 5 years warranty for this car. On the brochure it describes as you are covered to drive 7 times around the globe. The new Hyundai Sonata 2010 also won many international awards and it has been able to capture quite a number of market share from it’s competitors in our countries. Overall, we are impressed with what Hyundai did for the new Hyundai Sonata. 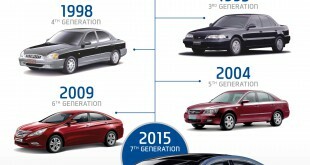 Hyundai took many design inspiration from the best car makers in the world. Unfortunately, the Hyundai Girls does not come with the Hyundai Sonata but you can still enjoy our gallery below.